Reagan Arthur Books, 9780316051927, 320pp. One Man, one day, and a novel bursting with drama, comedy, and humanity. Kevin Quinn is a standard-variety American male: middle-aged, liberal-leaning, self-centered, emotionally damaged, generally determined to avoid both pain and responsibility. As his relationship with his girlfriend approaches a turning point, and his career seems increasingly pointless, he decides to secretly fly to a job interview in Austin, Texas. Aboard the plane, Kevin is simultaneously attracted to the young woman in the seat next to him and panicked by a new wave of terrorism in Europe and the UK. He lands safely with neuroses intact and full of hope that the job, the expansive city, and the girl from the plane might yet be his chance for reinvention. His next eight hours make up this novel, a tour-de-force of mordant humor, brilliant observation, and page-turning storytelling. James Hynes is the author of the novels "The Lecturer's Tale," "Wild Colonial Boy," the stories "Publish & Perish" (all New York Times Notable Books of the Year), and the novel Kings of Infinite Space. He lives in Austin, Texas. "Hynes writes like Joyce on Quaaludes, in spiky, gorgeous language, with an eye for detail that is occasionally shocking in its apt particularity... Next occurs on one Bloomsday-like imaginary day and runs backward and forward in time to a heart-stopping finale that is one of the best endings of any novel I have ever read." "I already knew that James Hynes was the master of satirical, high-octane fiction but I did not expect him to be the genius of detail, too. Or to be so tender. NEXT - in which Kevin goes to Texas for a job interview and gets sidetracked by his lifelong quest for love - is that rarity, a lapidary novel of small compass and brief time frame which delivers a punch of global relevance. It is touching, shocking, intelligent, and - at least where matters of the heart are concerned - profoundly and subversively candid." "I'm a longtime James Hynes fan, but NEXT is one of the most surprising, delightful, compulsively readably and ultimately profound novels I've read in some time. I didn't know whether to cry or laugh or cheer when I finished it, so I just went ahead and did all three, then started over at the beginning." "Funny, surprising, and sobering . . . The final 50 pages are unlike anything in the recent literature of our response to terrorism-a tour de force of people ennobled in the face of random horror." "As Kevin frets his way through the single day on which NEXT takes place, he envisions many different threats. But the true stealth attack in NEXT is the one launched at the reader by Mr. Hynes. This is a book that begins innocently and is careful not to tip its hand, even though there's something very unusual at work." Regarding Kevin, Maslin asks, "Will he have the temerity to change his life forever? Talk about temerity: Mr. Hynes yanks the rug out from under Kevin so drastically that his own temerity will not soon be forgotten....Finally this book arrives at a resolution that makes breathtakingly perfect sense." "NEXT is more than a cultural travelogue. It's a dervish of a tale that whips personal and social anxieties into an unforeseen, but perhaps inevitable, climax." "Like Virginia Woolf's Mrs. Dalloway and Ian McEwan's Saturday, NEXT follows the events of a single day and relies on a subtle interplay of memory, trauma and thought. . . . The reader hangs on breathlessly as Kevin's thoughts swerve from past to present and beyond, reconciling what came before with whatever is to come in a seamless flow. 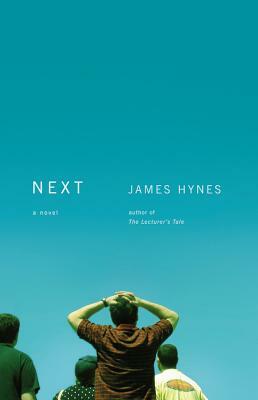 NEXT may be Hynes' best book-and one that reveals his gifts as a serious novelist." "Hynes is a rare writer. He is brilliant and humane, and he's created a novel that's as involving as it is dark, as compassionate as it is sad. It's a shocking, original masterpiece, and it is deeply, painfully American, in every sense of the word -- whatever that word has come to mean. NEXT is the kind of novel that leaves you reeling, almost speechless, frightened, scared to consider what it all means." "The last expert trick in this novel is that, despite playing with a certain medieval grimness, the book ends on an absurdly and rather lovely hopeful note. "Next" - that fatal word for the age-obsessed who fear the effect of time on their biology - has another face: There is a real future and a real way to be adult." "Hynes, a gifted comic novelist, is after something very serious here; he adopts a near-stream-of-consciousness narrative to tease at it, with Quinn more Dalloway than Bloom as he makes his way across the unfamiliar overheated Texas capital." "Hynes's novel contains many memorable passages and comic riffs; and his decision to shape the book around its high-stakes ending (50 pages of riveting, vivid, and unstoppable reading) does, ultimately justify and define the whole." "At first NEXT seems to be just an exceptionally well-written comic novel about middle age. But with great subtlety and nuance, Hynes begins to move the narrative into deeper, more compelling territory.... NEXT is sui generis-an essential piece of American literature that is both of its time and ultimately without present compare; a novel that is about us, all of us, living our lives in the mayhem of our own particular drama, inevitably blind to the surrounding mayhem until it is much too late."